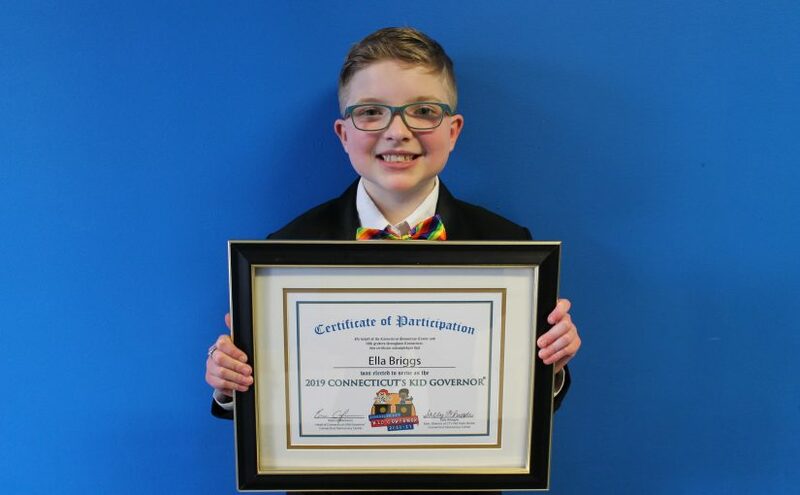 Avon, CT— On Wednesday morning, the Connecticut Democracy Center (CTDC) announced that fifth graders across the state had elected Ella Briggs as the 2019 Connecticut’s Kid Governor® (CTKG). The announcement came during a school-wide assembly at Ana Grace Academy of the Arts Elementary Magnet School in Avon where Ella is a fifth-grade student in Mrs. Davis’s class. A breaking news segment featuring reporter Kent Pierce and Secretary of the State Denise Merrill shared the election results with Ana Grace students and online viewers across the state and nation. Classmates cheered and chanted Ella’s name and the Hartford Gay Men”s Chorus performed as Kid Governor-Elect Ella, who ran on a platform of LGBTQ youth safety, thanked voters, classmates, teachers, and family (dogs included) for their support and encouragement. You can watch Ella’s campaign video here. You can watch video of Wednesday morning’s announcement here. Ella’s three-point platform focuses on promoting adoption for LGBTQ homeless youth, teacher training working with LGBTQ students, and developing youth programs for LGBTQ kids and allies. More than 6,400 Connecticut fifth graders registered to vote in this year’s Statewide Election as students across the state were nominated by their classes to run for Connecticut’s Kid Governor. The award-winning statewide civics program, which is in its fourth year, was created by the CTDC (formerly known as the Connecticut Public Affairs Network) in order to teach students about state government, voting and elections, and the importance of civic engagement, Candidates were required to submit a campaign video about a community issues important to them, as well as a three-point plan designed to help other students take on the issue. Seven final candidates moved onto the week-long election and their videos were posted to the CTKG webpage, CT.KidGovernor.org, for their peers to watch before casting their ballots. 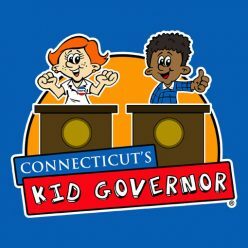 You can learn more about Connecticut’s Kid Governor®– both the program and the student– at CT.KidGovernor.org or by following CTKG on Facebook, Twitter, and Instagram. “Breaking News” Segment featuring Kent Pierce and Secretary of the State Denise Merrill. Live Announcement of the 2018 Statewide Election Results from November 21, 2018.